Our sister, Mary Ann Laycock, has departed from our midst at the ripe age of seventy-six years, having been born on 1st Jan., 1827. She could look back to the beginnings of Primitive Methodism in Dewsbury, as she was brought up in the house of her uncle, John Bedford and his wife, who were among the first Primitive Methodists in the town. It was a pleasure to her to recall the visits of the Rev. Hugh Bourne to her uncle’s, when visiting Dewsbury on his way to Leeds. The influence of a godly home and the frequent visits of the early preachers resulted in our sister joining the class of the infant Society, when just entering her teens. She became a teacher in the Sunday School, and thus laid her talents on the altar of consecration. At the age of twenty-five she was united in marriage to John Marsden Laycock, and being the first couple married in the chapel they received from the trustees a Bible, which was much treasured by our sister. As soon as she had a home of her own its door was opened to the ministers of the Connexion, and ever after an ungrudging hospitality was generously displayed to the servants of God. Her kindliness of disposition and large-hearted benevolence were evidenced in her readiness to do good and help the poor, the sick and suffering. 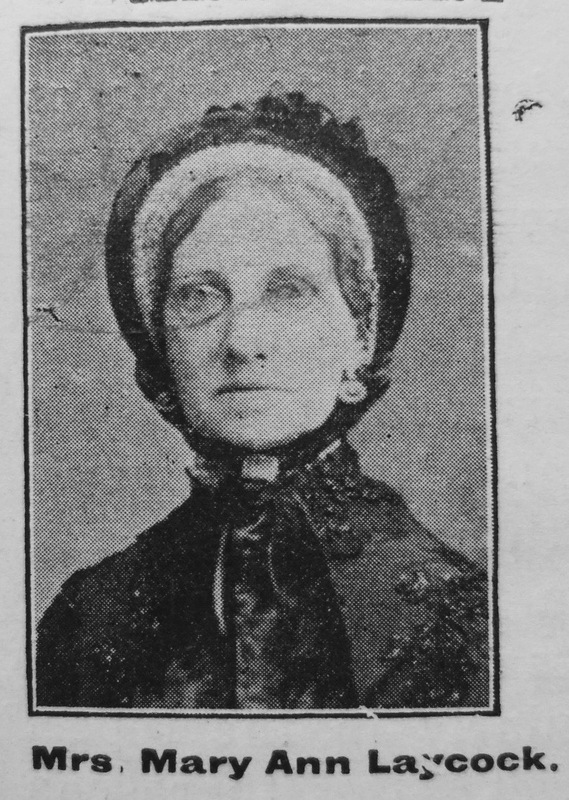 Her generosity was not confined to the requirements or institutions of her own Church, for whilst she gave a ready support to these, the British and Foreign Bible Society, the Hull Sailors’ Orphan Home, the United Kingdom Alliance, the British Women’s Temperance Society, and other kindred institutions shared in her benefactions. The end came rather suddenly, not through heart failure as her long affliction might naturally have led her friends to expect, but through congestion of the lungs. On the Sunday night, July 5, she expressed a desire to see the writer, who visited her, and found her very feeble but perfectly conscious. Her response to the prayer offered told how fully she was trusting in Him who had been her trust and hope for so many years, and that she sweetly realized that “underneath were the everlasting arms.” And a few hours after, she lost, in His kind embraces, the “bitterness of death,” and calmly entered into that rest which remaineth for the people of God. Mary Ann was baptised on 11 February 1827 at All Saints, Dewsbury. Her parents were Duke, a clothier, and Hannah Tolson. Before her marriage, Mary worked as a house servant. 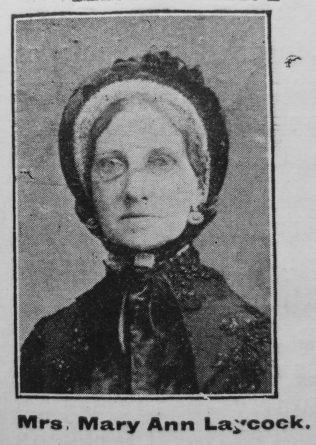 She married John Marsden Laycock (1830-1893) in late 1851 at Dewsbury, Yorkshire. John was a joiner/builder when they married and later (1871) was an income tax collector. Census returns identify four children. Mary died on 5 July 1903 at Dewsbury, Yorkshire.